Five people are missing after a fiery explosion ripped through an eastern Oklahoma drilling rig on Monday, sending plumes of black smoke into the air and leaving a derrick crumpled on the ground, emergency officials said. More than 20 employees were at the natural gas well site when the blast was reported around 8:45 a.m., Pittsburg County Sheriff Chris Morris said. 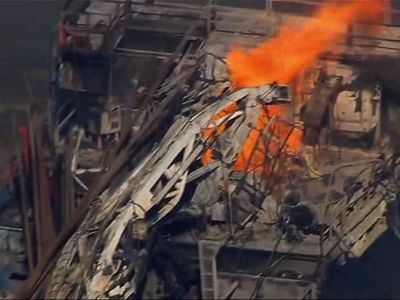 Aerial footage showed several fires were still burning by midday on the rig and other equipment; the derrick, a towering metal structure above the well, collapsed onto the ground. Emergency crews were pulled away after other explosions at the site, where several tanks are also located, Pittsburg County Emergency Management Director Kevin Enloe said during an afternoon news conference. “Pretty much everything that is on location is on fire,” Enloe said. A statement Monday night from emergency management said the fire was out. The explosion occurred west of the town of Quinton, about 100 miles (161 kilometers) southeast of Tulsa. Enloe said firefighters were letting the blaze burn and weren’t putting water on it to keep from spreading possible hazardous materials at the site. 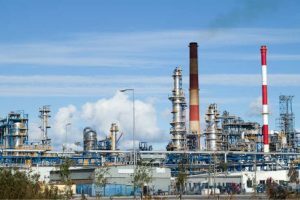 Enloe said about 17 workers were pulled from the site following the blast, including one who suffered minor burns and was treated at the scene. He said crews were searching the surrounding woods to see if anyone had fled into the area. “It’s a pretty dramatic deal to go through,” he said. Confirmation of any fatalities wasn’t expected to be possible until the fire was extinguished and investigators could get to the scene of the explosion, said Amy Elliott, a spokeswoman for the Oklahoma medical examiner’s office. “I pray there’s not, but we just don’t know yet,” Elliott said. State environmental and regulatory officials were heading to the scene after being notified, according to Oklahoma Office of Emergency Management spokeswoman Keli Cain. The drilling site was being operated by Oklahoma City-based Red Mountain Operating, said Matt Skinner, a spokesman for the Oklahoma Corporation Commission, which regulates oil and gas operators in the state. Telephone and email messages left by The Associated Press with Red Mountain were not immediately returned. Houston-based Patterson-UTI Energy Inc., a drilling rig operator, confirmed in a statement Monday that some of its employees remain unaccounted for. “The cause of the fire is unknown at this time,” the company said. Skinner said a company that specializes in rig fires and other well control problems also responded to the blaze.